Isabella Rossellini, Italian actress, filmmaker, author, philanthropist, and model, shares secrets of the Ramble. Central Park's 36-acre wild garden. To use the words of Park designer Frederick Law Olmsted, The Ramble is a 36-acre "wild garden." Central Park's designers imagined a tranquil spot where visitors could stroll, discover forest gardens rich with plantings, and meander along the paths. This truly is a place for the urban explorer to escape the city and get utterly lost in nature. This was one of the first parts of the Park to be built, and except for the bedrock platform, it is totally artificial. Even the water running in the stream and the adjacent Lake is turned on and off like a faucet. Some of the trees you see date back to 1859 when the Ramble was planted. Beneath the leafy canopy, you are surrounded by a thriving wildlife habitat. Because of its location on the Atlantic Flyway — the migration route birds follow in the spring and fall — the Ramble is the center of birding activity in the Park. Over 230 species have been spotted, and over 40 other species remain in the Park all year long. Every year, more than 42 million people visit Central Park, which is more than any other urban Park in the world. 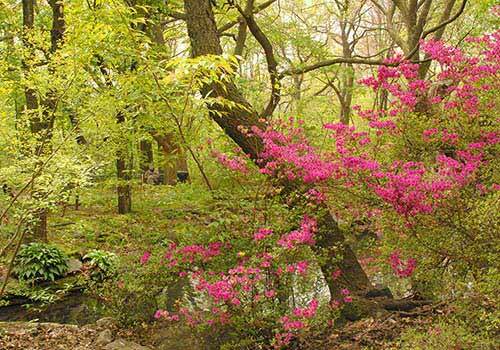 By working with environmental groups, the Central Park Conservancy has developed a woodland restoration and management plan, which involves your participation as well. First, "carry in, carry out." All of the trash and recycling bins have been removed from inside the Ramble, and placed at the entrances. If you enjoy a picnic in this beautiful setting, don't forget to take your leftovers with you and dispose of them properly. It's a simple gesture, but it really helps the environment and the Conservancy staff responsible for its care. Mid-Park from 73rd to 79th Streets.